In ELMA, a complex project task is a list of activities. Unlike a user task, a complex task is executed not by one person, but by several people. The advantage of a complex task is that a user can create a list of activities, edit and control it. A complex task is convenient for the users, who coordinate human resources during the task execution or need a list of activities performed. All the information is displayed in one place. A complex task implements the Ad Hoc (task list) concept. The order of the task execution is not so important in a project, only the fact of completing the tasks is important. Note that only the users who have access to the ELMA Projects+ module can work with complex tasks. A sales department employee creates a request for holding an event and sends it to the director for approval. The director approves the request and selects a responsible coordinator. Next, the coordinator receives a complex task, which needs to be activated by clicking In Work (fig. 3). After you click on this button, a block will appear, where you can add a list of activities, specify executors and due dates. In the block, you can create, edit, delete and mark tasks as completed. Once all the activities are completed, the coordinator clicks Completed and the process finishes. When you add a task to the list you can specify an executor and a due date. Note, that the list of executors must be added to the Executor of Complex Project Task Element object. 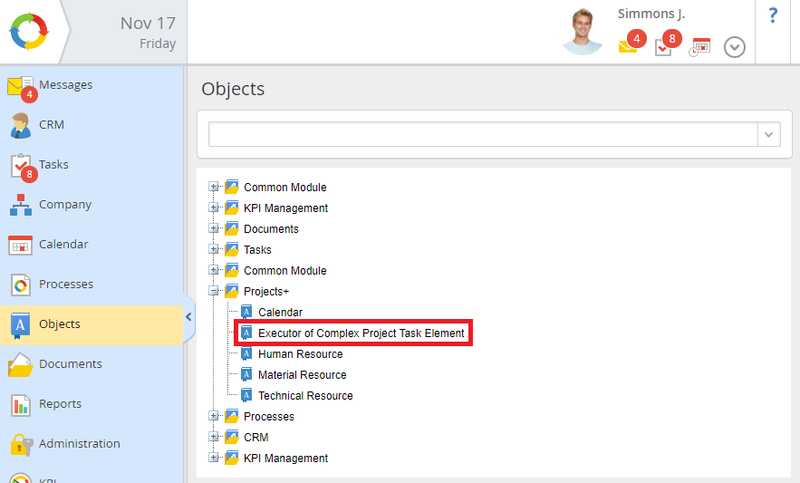 If you have permissions to add elements to the object, go to Objects and select Executor of Complex Project Task Element in the Projects+ folder (fig. 5). On the opened page, click Create in the toolbar to add a new executor (fig. 6). Next, enter the name of an employee and click Save. All the employees added to this object can be selected as executors in a complex task.